Last night I had the pleasure of teaching a session on “Jewish Time” for the community-wide introduction to Judaism course, hosted by the JCC. How exciting to introduce learners, seekers, and future members of Jewish families, whether through marriage or conversion, to unique aspects of Jewish life and practice. Somehow we covered topics as diverse as “Why is it year 5779?” to “How is Shabbat an antidote to slavery?” For the last few minutes I answered questions about Reconstructionist Judaism; as you know I am fond of sharing our rich and values-based legacy. Todah rabbah to Rabbi David Brusin for leading last night’s shiva minyan for Bob Jacobs and to the many community members who gathered to support Marilyn and her family. We will gather again this evening and hope that the weather does not preclude participation. Of course safety is of the utmost importance, and Marilyn will certainly be pleased to hear from you at any time. Staying in touch and expressing your concern and affection after shiva is over is a mitzvah! As a result of tonight’s shiva, Shir’s February board meeting has been moved to next Thursday evening. It is the first meeting with our new leadership and everyone is welcome to join us! And as always, I invite you to look below for more ways to engage with and support our community through ritual, study, good works, and FUN! While it will be tough to compete with the weather for any news this week, I am going to try, especially because there is so much warmth to share after this past weekend. Even given our first burst of cold, we had at least a double minyan brave the weather to celebrate Shabbat together and explore Reconstructionist thought. From Rabbi Brusin’s story of discovering RRC when he did not fit in anywhere else, to acknowledging that our congregational growing edge may be in our exploring the role and experience of our non-Jewish members and guests, we touched on a wide variety of issues and ideas, both personal and communal. Missed it? Look for a reprise of the learning as an Adult Education program in the coming weeks. After enjoying a very low key Shabbat day with my family, I experienced an amazing Sunday which contained concentric circles of lovely people and energy. That morning, I was honored to be at the funeral for Barbara Lutsky’s father, Milton Schwartz. I had never met Milton, and learned that this was a man who epitomized the idea of a mentsch. He was hailed as considerate and thoughtful, a man who listened more than he spoke, treated every person with respect, supported his family and his business with diligence and care, and kissed his beloved wife hello and goodbye every day of his life, while appreciating every kindness she, and all, bestowed upon him. How grateful I was to be reminded that there were, and still are, people like Milton Schwartz in our world. Next on the calendar was our Shir annual meeting, highlighting our activities of the past year. With updates to our dues structure, our administrative organization, our space, and our board leadership, CSH is ever evolving! The energy was upbeat and positive. See below for more details about the meeting and opportunities for getting involved as we continue to build our programming at CSH and in the wider MKE community. Finally, I was this month’s host for the Interfaith Conference of Greater Milwaukee’s “Amazing Faiths” dinner. Ten participants representing eight faith groups, plus a moderator, enjoyed a light meal in our dining room and explored how faith works in their lives and traditions. While our role was limited to providing food and space, we definitely absorbed the energy of fellowship. I spent part of the evening sitting just beyond the dining room door catching up on the days email, and so appreciated the counterpoint that the conversation behind me made to the daily news! If you have not been to any of the IFC’s programs I hope you take a look. On February 24, I will be helping with the second installment of the “Amazing Faiths Dinner 2.0” program, which features a presentation by a local faith community (Ba’hai this time) followed by a shared meal and conversation. As I noted at Sunday’s meeting, my community efforts have decidedly been in the areas of interfaith and justice work, including the Black-Jewish caucus, the Jewish-Catholic programs at the Federation as well as the Lux Center, as well as the IFC, and, of course, MICAH and THI. Sadly, all these warm relationships will not be enough to protect us from the arctic conditions out there, so stay warm and safe. Good news is it sounds like we will have a reprieve before Shabbat! 1) Even when we think we know the story or content, we never get it quite right and find ourselves learning it all over again! 2) Whether we recall something correctly or not, we often see with new eyes or from a new perspective and perceive something wholly new. The hiddush (a new idea – from the same root as hadash!) this week took place at the burning bush. For a long time, the interpretation that has been prominent was the idea that it was Moses’ ability and willingness to pay enough attention to even notice that the fiery bush was not being consumed. As we looked closely at the text this time another detail called out. Moses was walking by shepherding his sheep and noticed the fire in the bush. And then he stopped and turned to take a closer look. Perhaps it is the challenging times we live in that made this moment feel so important. It is so easy to see something and continue walking along. What does it mean that Moses was concerned and interested enough to stop what he was doing and change his intention and focus? What would it mean if all people had the curiosity and concern to stop, and to turn, engaging with something outside of our own agenda or trajectory? Wow, what a party and what a feast! We are so grateful to Lil Rev and his friends for amazing music, humor, and important messages to think about at this time of year, and this year in history. Thanks to Sam Essak and the latke crew for immersing themselves in oil on our behalf. As usual, Marlene, Adam and Erin went beyond the call – they take such good care of us! Thanks in advance to Jen and Sam Essak for hosting Shabbat Dinner tomorrow. Their table is full. Opportunities for feeding the hungry abound this month. Shir is once again providing and serving the Christmas day meal at St. Vincent de Paul. Plus, we have been invited to participate in the annual Pathfinders holiday meal, taking place at our usual space in Plymouth just before our December 21st Shabbat/Solstice service in the Graham Chapel. AND there is still time to contribute to Tikkun Ha-Ir’s holiday gifts for the homeless as well as have your financial contribution to THI doubled. See all the details below. Also below, you will also find a link to our member survey. Shir leadership would love your feedback! SO many thanks to Kai Mishlove and special guest Samaher Aldaye who taught us so much about the situation with refugees here in MKE. Their experiences were enhanced by the screening of parts of the new film THIS IS HOME. If you missed it, or are excited to see the film in its entirety, stay tuned as we work to bring the film to a MKE-wide audience. Also stay tuned as we begin to organize opportunities to get involved supporting local refugee families. And now it is time for us all to rise up and do something, including redoubling our commitment to support all those seeking safety and asylum in this country, and including electing a government that supports the basic human rights of all people, regardless of gender (cis, trans, or non-binary), sexual orientation, religion, skin color, language spoken, country of origin, or previous convictions. These rights must include freedom from fear of physical or emotional harm, from slander and lies, and from being detained while doing the activities of daily living. It includes the right to vote, and easy access to fulfilling this right. It includes the assumption that ALL PEOPLE are considered innocent until proven guilty. On Sunday, Shir members gathered to pray, vent, and process. One theme evident soon after we arrived was that many were neither shocked nor surprised that an event like this could happen in the current political climate. The primary theme just before our departure was the importance of loving, and caring, and giving even more within all the communities we are part of. Then, Monday evening’s MKE community-wide vigil was powerful and empowering, as all facets of the Jewish, religious, and civic communities gathered in solidarity. One theme from the evening echoed our own: love more! Another has been expanded into a nationwide movement: Go to shul this shabbat, and invite your friends and community to join you. In support of that effort, two things are happening at Shir.Friday night will be a “pop-up” Shabbat dinner, not previously scheduled, for all who wish to be together this Friday evening. The morning Song and Study is being moved to our space at Plymouth and will feature an Islamic scholar from Marquette who will join us for a text study and teach us about the Genesis stories that appear in the Quran. Lastly, while you have likely received or seen myriad statements, there is an exhaustive response from the Reconstructionist movement regarding the Pittsburgh shooting, including news regarding our affiliated community, Congregation Dor Hadash, on the Reconstructing Judaism website. This week, Justice lost a fight and a fighter. It is difficult to follow my own advice from the High Holy Days with the whirlwind of politics that escalated over the past weeks, culminating in appointment of a new Supreme Court justice via a process that seemed far from just. When I think of how a group of us sat together on Shabbat morning and wrestled with issues of gender and equity in our tradition and liturgy, I am reminded of how deeply entrenched male power is in human society. And while we progressive Jews can look at the stories of men acting badly throughout Torah as lessons of lo ta’aseh – don’t do that – we know there remain plenty of Jewish communities that continue to treat our texts and patriarchs as without blemish. Equality between men and women lasted all the way through chapter one of Genesis. Yet, we also see examples of women taking stands, demanding their rights, and men accepting blame and apologizing. Read the story of Tamar fin Genesis chapter 38 or some inspiration! But the examples are sadly scarce. We have a long way to go. And we cannot become caught in the frustration and anger, but rather must look forward, both far and near, and figure out how we can help create the world we want to see, in our homes, our communities and our workplaces. We must each have a vision and determine where our energy and our priorities lie, trusting that collectively our myriad passions and skills will cover the breadth of possible need. The only unacceptable outcome is anyone looking back and thinking, Why didn’t I….. or I should have……. Estelle Katz, who died last week, had vision. One vision, her desire to be a physician, was not one she was able to fulfill in her lifetime due to restrictions based on her religion and gender. Throughout her life Estelle found ways to support others oppressed because of their minority status, in both very personal and and via legal, organizational avenues. She pursued justice as long as she was able. Her commitment is a model for caring about those both near and far. Below you will find information on a number of community events focused on justice, both near and far. Well before the Kavanaugh hearings highlighted the issue, the Milwaukee Jewish community had launched an effort to address the issue of domestic and sexual violence. I was excited to be part of a very diverse group of representatives from the Jewish community to begin to vision this effort, called SHOFAR. The kick-off event will take place on November 13th and feature gymnast Aly Raisman. This weekend, Rabbi Shmuly Yanklowitz will be speaking in our community at CBINT. I worked with Shmuly as a student and was thrilled to watch as he made a huge impact in NYC with the Teudat Tzedek – a certification that restaurants were service just food and not just technically kosher food. I expect his talk to inspire us for the work ahead of us. Rosh Hashanah is behind us. ……. I am still hearing and feeling the echoes of Rosh Hashanah: our music, wisdom shared by our speakers, voices of readers of Torah and poetry, the beauty of our new artwork, the delight of being together. During these these days-in-between you might find moments to stop along the way to hear your own echoes and to remember if there was anything that needs to be said to someone close to you, including yourself. As you heard from Jason, the list of people to thank is long, and much longer still when we add the names of those who made SO much happen over the past year. As you heard from me, we will continue to work on ways to make it easy, rewarding, and meaningful to connect to and support one another and the community in the coming year. Looking back and forward, I wish to acknowledge Max Samson and Michelle Bak, who led the RHII retreat and are leading and Shabbat Shuva Service, respectively, enhancing our holiday experience and allowing me to be a bit more Michal and a bit less Rabbi for some blessed moments during these days. I appreciate the compliments, comments, and requests received following Rosh Hashanah services as I continue to fine-tune our ritual for Yom Kippur and think about the years to come. There will be a formal opportunity to share feedback when the holidays are over, but your input is welcome at any time. Please look closely at the schedule below for all the details for Yom Kippur and the plans for the weeks to come! Please also note the special requests for maintaining our sacred space, the HHD Food Drive, and break-the-fast meal. I have returned to wonderful MKE after a week in what sometimes felt like another world. 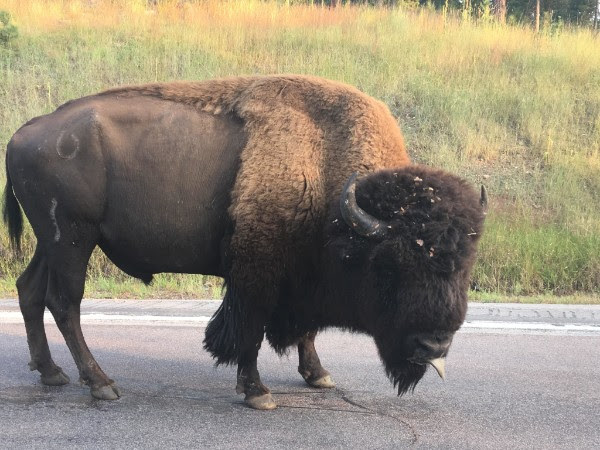 The beauty, the open sky, and the amazing buffalo and other wildlife were memorable (see below for a great look at an amazing beast!) However, what had the most impact on me was delving deeper into the history of the region. It was hard not to feel sad and angry, and to explore my role or responsibility as the descendant of individuals struggling with their own oppression on another continent. On Yom Kippur day I will share some of my experience and of my inquiry into the nature of humanity and of religion, referring to the biblical rituals and traditions as well as an exploration of native society. I hope to see many of you this Saturday night as we wrestle with making ancient traditions of the Days of Awe relevant and meaningful. And please see below for opportunities to engage more deeply in the rituals, liturgy, and community during our HHD services. The Torah was commanded to us by Moses, right? Well, maybe not, but that does not stop up from chanting these words as we redress the scroll. Part of the beauty and wonder of our approach to Jewish tradition is blending the mythic and historic, the literal and interpretation, and enhancing keva – fixed practice – with kavannah – intention. As we studied the book of Deuteronomy this past shabbat we simply accepted that some verses from chapter 6 went into the black box of the Babylonian exile and came out “the Sh’ma”, as did a lot of the rabbinic practice that appeared in the Mishnah in the third century C.E. We read in the book of Kings that a priest of King Josiah of Judah “found” a book of law that mirrored Josiah’s own political and religious priorities, which were immediately instituted. Yet this knowledge does not temper the reverence with which we regard these texts. The “discovery” of Deuteronomy in the early 600’s prompted us to want to know about the history of the other books or Torah, history that I could not give in sufficient detail. So, as any good teacher does when she can’t answer her students, I did some research. Here is the current state of scholarship on this topic. The oldest texts are likely the J texts, which may date back to the unified monarchy of David and Solomon in the 10th century B.C.E. The E texts are at least a century younger and likely a contribution of the northern kingdom of Israel. The Priestly texts are the youngest and attributed to the Babylonian exile as well as early in the period after the return in 539 CE. This P source is also credited with a significant redaction role. This is certainly interesting and useful information to think about. But it doesn’t do so much for our emotional or spiritual lives, I suspect. So, as we celebrate the treasure of our Torah on Shabbat morning, singing Torah tziva lanu Moshe! is a pretty good interpretation. This week marks a year since my family and I arrived in Milwaukee and to Congregation Shir Hadash. It has been a lovely year and we are grateful be here and looking forward to year two! If you check out you Milwaukee Jewish Chronicle you will find my column on the challenge of the conflicting calendars in summertime. As Americans, especially this week, we are all about rest, leisure, and barbecues. The Jewish calendar spends these same months counting the days leading to disaster as we remember the destruction of the temples and myriad other Jewish catastrophes. In the article I suggest that today we need to use this day to look beyond our own stories and history and respond with empathy to those of our neighbors as well. Of course, this includes the disasters unfolding around us daily, so this year mid-summer mourning does not feel so far off. I was honored to represent Shir at the immigration rallies last shabbat and pleased that both Susie Stein and I made the local paper and national media with our experiences as the child/grandchild of immigrants. We have a lot of work to do to assure that our nation’s sick be healed, captives be freed, and those bent down be brought upright. Looking forward, I hope many of you will join us for the special program on the Israeli-Palestinian crisis on the 9th and invite friends who will be interested. And it is an important time for us all to have opportunities to be with nurtured, fed, and connected, so I hope someone is inspired to host our community table on July 13th. Please let me know! One year together – so exciting, right? Did you know Rabbi David and Sandy are celebrating 50 this shabbat? Come join them, and your Shir chevre this Friday at 7 in our usual space. It will be good to bring our hearts, souls, and voices together in prayer and community.